One of the best ways to infuse life into the skin is to bleach it regularly. In today’s times when our skin fights a lot of external aggression with pollution, stress, unhealthy lifestyles, it takes double the effort to keep it lively, radiant and glowing. So when most of the bleaches are filled with harmful chemicals and preservatives which are harmful for the skin in the long run, Oxy face bleach makes the skin soft, supple, healthy and beaming with joie de vivre. It is one of the mildest bleaches and hence does not have any allergic reaction to the skin. Hence, those with very sensitive and acne prone skin can also use with without a thought. Read more on how to remove tan. So when one is seeking tips for glowing skin, it is very easy to just use Oxy face bleach and see how it makes the skin spotless, provides instant flow, evens the skin tone and even removes dead skin cells, opening clogged pores and making way for the healthy growth. Oxy bleach is also one of the best ways to get rid of sun tan during summers. 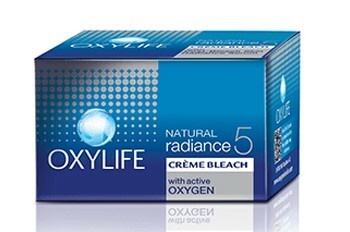 Infused with active oxygen, Oxy bleach is easy to use and gives positive results in just 15 minutes. Oxygen helps to bring to life the skin cells, lack of which causes them to make the skin lifeless, dull and wrinkled. It also helps battling the ill-effects of environmental pollution. This face bleach is filled with the goodness of Aloe vera that helps smoothen and heal damaged skin. Oxy bleach works on a simple formula of infusing oxygen in the skin so that it can breathe easily. Once the bleach is applied to the skin the released oxygen nurtures, rejuvenates, uplifts and shields the layers of the skin making it youthful and glowing. Key ingredients of the bleach include: Bleach Cream, Hydrogen Peroxide and Powder Activator known as Persulphates. · Wash your face with water and pat dry. · Apply the pre-bleach cream and massage gently on the face for at least five minutes or till the cream gets totally absorbed into the skin. The pre-bleach cream is supposed to form a protective layer for a sensitive skin, so that the bleaching experience remains positive and rash-free. · Then take the bleach cream and activator powder in the ratio of 7:1. · With the help of spatula, mix the cream and the activator in a bowl till the powder completely dissolves. · Apply the bleach across the face, carefully avoiding the eyes and nose areas. · Let the cream sit for at least 15 minutes. If you have a darker skin tone, you may let the bleach set in for another 10 minutes. · Wash off face with cold water and pat dry again. · Apply the post-bleach radiance serum and massage gently across the face for at least five minutes. Also, even though the Oxy bleach is very mild and natural product, it is important to first try a little portion on the arms to confirm any allergic reaction. A small pack of Oxy bleach for one-time use contains a 7 g bleach cream, 1 g powder activator, and 1 g pre-bleach cream. Also there is an instruction leaflet which must be read thoroughly before use. Since it is reasonably priced, Oxy Bleach can conveniently be used as one of the best ways to counter skin tanning and get a beautiful and happy skin. So now when you are wondering how to get fair skin, just grab Oxy bleach and feel the difference!